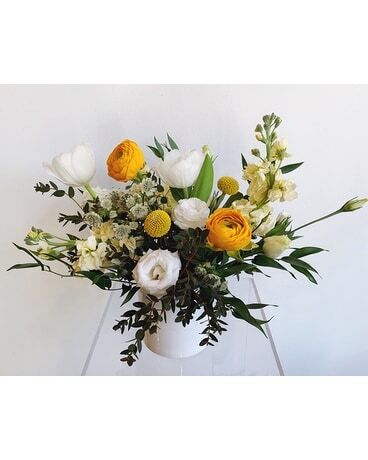 This sweet petite design includes 2 yellow billy balls, 2 yellow ranunculus, 3 white tulips, 3 yellow stock, 1 white astrantia, and 1 white lisianthus with seasonal greenery in a 4"x4" white cylinder vessel. 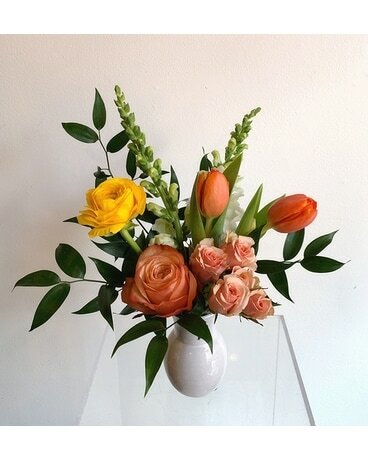 This petite design is made of 1 yellow ranunculus, 2 orange tulips, 1 kahala rose, 1 peach spray rose, 2 white snapdragons and Italian ruscus in a 3” white ceramic budvase. A tall, lush design filled with color. 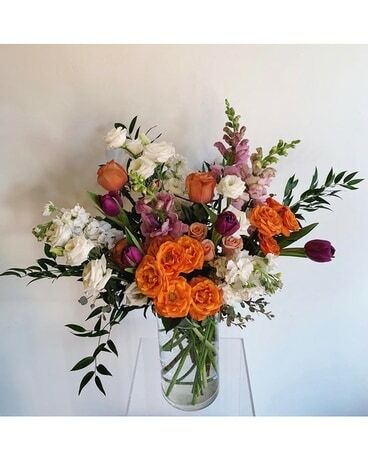 3 orange spray roses, 2 peach spray roses, 3 peach kahala roses, 3 lavender snapdragons, 4 purple tulips, 3 white stock, 3 white lisianthus, ruscus and eucalyptus in a 10” tall glass cylinder vase. 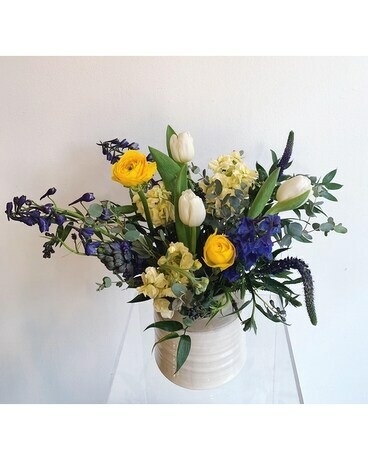 This low and lush design is composed of 2 yellow ranunculus, 3 white tulips, 3 blue delphinium, 3 pale yellow stock, 1 purple hyacinth, 2 purple veronica and a mix of greenery. Designed in a 5” ceramic vase. A simple, airy design in a green ceramic vase. Includes 2 white snapdragons, 3 white lisianthus, 4 white tulips, eucalyptus and Italian ruscus. 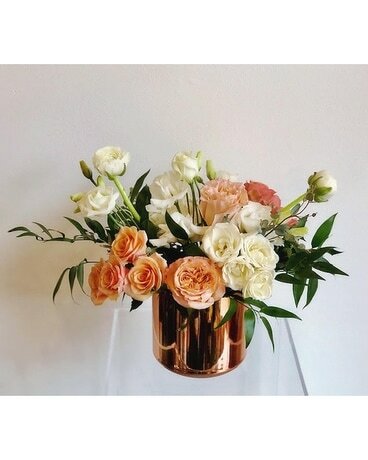 We are a boutique flower shop located in Hillsboro Village in the heart of Nashville, Tennessee. 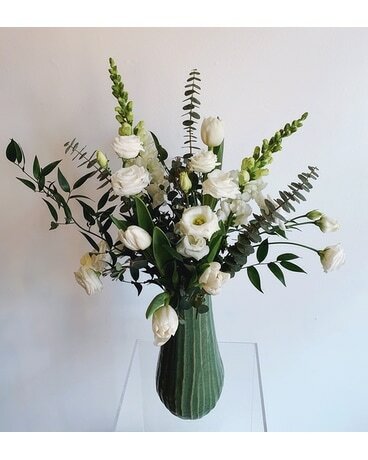 We specialize in cut floral designs for every day occasions and weekly recurring orders for any space! We are located in Hillsboro Village in the heart of Nashville, Tennessee. The name A Village of Flowers springs from the love of our village and our community.